The fast-casual, assembled to order, fresh ingredient restaurant has been popular in San Francisco and I usually lament that there aren’t more of those in LA. Well, now there’s a Chipotle for sushi right in downtown LA called Kazunori. Unlike its SF variants, this one has a limited menu and mainly serves handrolls. While there are sushi purists who lament this Chipotlezation of the sacred Japanese art of combining fish and rice, I embrace it. There are times where I want sushi but I don’t want to commit to 2 hour lunch, but I also don’t want to ride the danger zone of pre-made rolls at the supermarket deli. KazuNori is a tiny restaurant tucked next to a downtown parking structure. The U-shaped bar has a bunch of stools pulled up to it and you’re greeted by a simple menu that can be checked off, dim sum style, upon entering. The menu is limited to 3, 4, or 5 hand rolls or a la carte, or cut rolls for takeout. I sat down at the nearest open spot and checked the 4 handroll option with the daily special (toro), salmon, bay scallop, and crab. For its second week of opening, the KazuNori handroll machine is efficient. The sushi chef handed me a roll about a minute after I turned in my menu and as I finished rolls, the next one would be made and handed to me just as quickly. I can talk about the fish, which was of decent quality, but the stars of the handroll are the nori and rice. The rice was served warm, bordering on hot, and seasoned assertively. Although you have dishes to pour soy sauce in, the soy sauce was unnecessary. Each bite was perfectly salted thanks to the seasoned rice. Then, there’s the nori. The half-life of toasted nori is a short one. The distance from the sushi chef’s hand to your mouth should be as short as possible to maximize on optimum nori time. At KazuNori, the distance is short enough that the nori enters your mouth still toasted enough to flake off, almost like a good croissant. The optimum toastedness of the nori makes it hard not to scarf down each handroll as it is presented in front of you. Of the rolls I had, the bay scallop and crab roll stood out. The bay scallop had a mayonnaise-based sauce, which usually isn’t my thing, but in this case, highlighted the velvety texture of the scallops. The tiny amount of fish roe mixed in gave it a nice textural contrast. The ubiquitous crab roll was lighter on the mayonnaise if there was any at all, and the sweet taste of the crab meat was a perfect meal-ender. Who needs dessert when you can finish with the crab roll? KazuNori is located at strategic spot in downtown LA. Because a meal there is fast, it’s perfect for someone working downtown. The price is decent, not counting the $5 to park in the lot next door. While the craftsmanship and quality may not be as good as the 3-handroll special at Kiriko, I do like that the chef waits for you to finish each roll before making the next. Once they get their beer license in order, I am sure its 11pm closing time will make it a popular spot for the late-night dinner crowd. Well, I finally made it down to Maruhide Uni Club. When I first read about this uni-lover’s heaven, I really wanted to go, but it was just so far south that it didn’t seem worth it. I’m here to tell you it is worth it. I had the uni ikura salmon don and it was every bit as good as I had hoped. The uni was fresh, rich, salty, and tasted like the sea. I like that the restaurant provides different types of uni, which made it easier to compare tastes. Some bites were fresh and sweet, while others had a more savory, salty note. 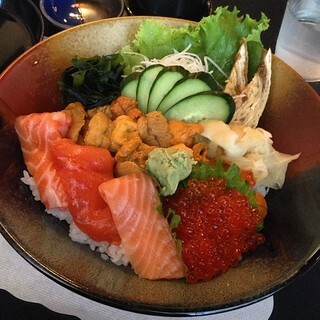 What surprised me was that the salmon in the bowl was also decent. The three generous pieces had that wonderful oily, salmon texture and the perfect amount of salt. Instead of the usual tamagoyaki, the bowl also included slices of uni tamagoyaki, which had the briny sea urchin layered within the rolled omelette. It was the first time I had it and now I’m wondering where it’s been all my life. The included bowl of uni soup was an enjoyable departure from the usual miso soup. Its light, delicate taste was a foil to the unctuousness of the rest of my meal. At $19 for this amount of uni, salmon, and salmon roe, it was a steal. One caveat: the menu is fairly limited, which is great because then people can focus on just eating uni. I was looking for edamame or an avocado maki for Robin and they didn’t have either. Lucky baby had to eat uni omelette, ikura, and rice for lunch. Disclaimer: My guest and I were invited to a meal at Sugarfish. We both were treated to the Nozawa and shared two bottles of sake. Just who is Lele Massimini and why was he inviting me to his newly opened sushi restaurant? I got the answer as soon as I walked through the door when I was greeted by an enthusiastic man. In addition to being part of the team behind the Nozawa brand and one of the brains behind Sugarfish, Lele’s also a man with a passion for the food industry. Since the tender age of 13, he has had a hand in the restaurant business in one capacity or another. Lele, who grew up in Rome, started his first job washing dishes. It wasn’t a dream of working his way to the top that spurred this, but simply a way to earn a few lire while still pursuing his other passion: boxing. A look at Lele’s face shows that he got out of the ring early. Now, he’s the front of house face of one of LA’s newest sushi restaurants. It’s easy to tell that Lele is a man passionate about his trade. Within minutes of sitting down, he gave us the mission statement of Sugarfish: to serve Nozawa-calibre sushi at half the price. The Sugarfish that just opened a few weeks ago is the child of many months of brain-storming and test runs. Cost was the most difficult issue when Lele opened the first Sugarfish in Marina Del Rel. Would it be possible to serve fresh, high-quality fish at only a fraction of what it would cost at Sushi Nozawa? Because of these yet unanswered questions, the opening weeks of the first Sugarfish was wrought with disappointment when customers found cucumber rolls filling their menus. Luckily, that issue has been worked out and Sugarfish now even has ala carte options for those too timid to try their signature “trust me” prix fixe meals. Did Sugarfish have to compromise quality to solve the cost problem? Three things make up good sushi. Fish, rice, and seaweed. According to Lele, Chef Nozawa hand picks all of the fish every morning. He does this for all of his restaurants. Because of his long-running history with the fishmongers, he gets a pretty good deal on fish with regards to quality and price. When you pick up that first piece of nigiri (with your hands!) at Sugarfish, one thing becomes apparent. The nigiri is fragile. The rice is moist, loosely packed, and above all else, very warm. It’s like holding a nice man’s hand on a blustery winter day. The second thing to note is that the rice is seasoned, border-line over-seasoned. I found myself ignoring the bottle of soy sauce and dipping bowl all night. Last in the sushi trifecta is the seaweed. The seaweed on the handrolls where crunchy, thick, and time-sensative. The first bite into a Sugarfish handroll, a blue crab handroll and a lobster handroll in this case, starts with the crunchy, savory seaweed and ends with the surprisingly warm rice and a healthy portion of fish. Although people may be encouraged to dip this into soy sauce, I suggest refraining from that to keep the handroll at optimum crunch. Sugarfish is definitely a good bang for your buck. If you just want a casual place to sit down and enjoy clean, no-nonsense sushi but avoid the wallet-hurt of omakase in front of a sushi chef, Nozawa’s your answer. The downtown location is large, darkly lit, hip, and a nice spot to drop by with friends. Just go light on the soy sauce because they certainly don’t go light on the rice seasoning.